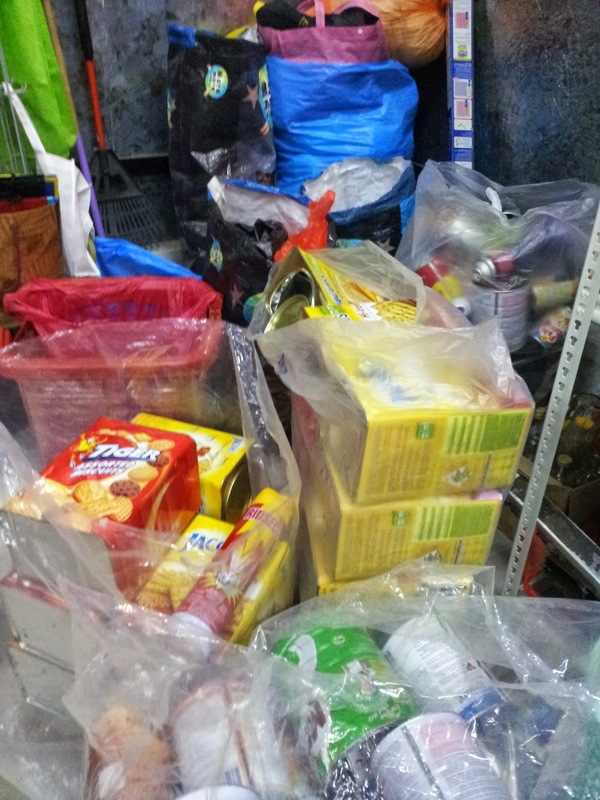 Volunteers and staff who work for organisations that collect reusable items for charity often complain that people tend to donate old, stained and ruined items in very poor condition. Not only is this habit rude, inconsiderate and insensitive, it is also wasteful. Many people mistakenly believe that they are 'doing a good deed' by 'donating' unwanted items to 'charity'. In reality, however, volunteers and staff waste many hours sifting through items that will most likely end up in landfills. Most of the time, only 5 - 10% of items are fit to be redirected to beneficiaries such as welfare homes and homeless individuals. Another 10 - 20% could be recovered for recycling. The rest of the 'donations' end up being thrown out as rubbish. What then, most people ask, can they do with 'all that stuff' that you can't use or do not want anymore? Green Living recommends reducing the amount of consumer goods you purchase, acquire and dispose of in the first place. Say no to unnecessary purchases. Reduce the amount of stuff you give out as door gifts, in goodie bags, as prizes and as gifts. Simplify your life by not accumulating clutter in the first place. One of the reasons why so many households and individuals end up disposing of, or trying to 'donate', items that were at one point valuable and valued is because they do not know the proper way to care for things, or keep things clean and serviceable. The longer you are able to make a possession last, the less money you have to spend on replacements, and the lower your impact on the environment. Here are some basic methods of caring for common items in order to make them last longer. - Wash dark and light-coloured items separately to prevent staining, fading and colour runs. Turn clothes inside out prior to washing to protect the outer surfaces. Pull zippers up fully to prevent the rough edges of open zippers from damaging clothes in the washing machine. Put delicate clothes in mesh laundry bags to prevent stretching and damage. Wash in cold water whenever possible (rub soap or detergent on stains first), as clothes last longer when subjected to less heat. This will save energy, too! - Don't hang up clothes that can stretch out of shape, such as sweaters. Fold them instead. Don't pull on t-shirt or sweater collars when putting them on hangers, otherwise they will stretch out of shape. Similarly, don't fold clothes that need ironing or they will become even more creased. Using higher heat on clothes (for ironing) will make the fibres break down faster and waste energy. - Avoid soaking clothes for more than a few minutes, or using bleach, as both can break down fibres in clothing. - Patch or mend tears in fabric (esp jeans) as early as possible to prevent the holes from becoming larger. - Frequent laundering and washing will wear clothes out. To reduce laundry loads, keep categories of clothes separate -- office, housework, exercise and bedtime. Don't wear your nicest or newest clothes for housework or exercise. Wear older clothing as exercise, housework or gardening clothes, rather than buy different sets of clothes. Hang up clothes that you can wear again for the same purpose without washing. Hang up pyjamas every morning to let them air out, rather than wear them while doing housework and having to change into another set of pyjamas every night. - Wear clothes for as long as possible. Stained, torn or faded clothing should be used as cleaning rags, floor mats or pet bedding, instead of donated to charity. Only donate clothing that are in good condition. For example, if you have too many t-shirts, put aside the free t-shirts you get from events and product purchases immediately and donate them to the needy while they are still new. - Clean and polish work/leather shoes frequently to prevent dirt from entering into the cracks and making the cracks permanent. Polishing also prevents leather from becoming dry and cracked. - Don't wear dress/office shoes for driving. The back heel of shoes can become damaged and discoloured from rubbing against the car floor mats. Have a pair of spare shoes in the car for driving instead. - Washing sneakers/trainers will make them look newer, and prevent dried-up dirt from wearing down the soles. - Rotate your shoes to give the insides time to air out. Stuff sheets of rolled up newspaper into damp shoes to help them dry out faster. - Wear socks or stockings to prevent shoes from becoming damp or smelly. Sprinkle baking soda in shoes to deodorise them. - Have your shoes repaired by a cobbler. Get soles stitched back on or have the shoes resoled. - Store shoes neatly to keep them clean and help them retain their shape. Don't stack shoes on top of one another unless they are in boxes. - Rubber clogs (e.g Crocs) are easy to repair. Straps can be reattached using cable tie, shoelace bits or ribbon, and worn-out and smooth soles can be given traction again if you use a penknife to carefully retrace the lines on the soles. Don't cut too deep or you might punch a hole in them. - Try to keep backpacks and bags dry and out of the rain. Use leather protector spray (from the shoe shop) to protect handbags, briefcases and leather bags. - Clean your hands before rummaging in your bags. The fewer cleaning products you use on your bags, the longer they will last. - Don't put your bags on the floor. Keep them clean and away from hot, wet, dirty or rough surfaces. - Don't hang your handbag from the back of chairs or from hooks, as this can damage the strap over time and cause the handbag to go out of shape. Use a handbag caddy (or make your own) to keep the insides of your handbag tidy, clean and protected from sharp objects such as keys and pens. - Don't leave bags in hot cars, as fabrics and fibres break down more rapidly when exposed to heat. This is especially so for the plastic and non-woven cloth shopping carrier bags. Keep reusable shopping bags in the trunk, glove compartment or under the car seat instead, or better still, at home by the door, ready for your next grocery shopping trip. - Don't hang up heavy backpacks or the straps and fabric will start to tear. Designate a chair or other sturdy surface to put them on instead. Don't overload backpacks and travel bags. Carry some items in your hand (e.g. with a book strap) on in a separate bag. Not only will this help backpacks last, it will also protect your back from injury. If you overstuff backpacks, you will often find that the zipper will break. Don't do the sitcom act of sitting on suitcases either. Pack wisely and ensure suitcases can close easily. - Have backpack zippers repaired by tailors or at jeans and leather repair shops. Mend tears and rips with adhesive patches (available at camping stores), as sewing and stitching can often introduce holes in fabric where there was none before. - The main reason mattresses and pillows are 'donated' is because they are stained, wet or damaged. This is impolite and insensitive. If you are not willing to sleep on such a mattress anymore, chances are, homeless folks and residents of welfare homes are not, either. Donate only items that are still usable but not suitable for your purposes anymore, for example, it is the wrong size for your new bedframe. Stained, wet and damaged mattresses belong in a landfill. As such, try to keep your mattresses out of landfills by taking better care of them. - Do not jump or stand on mattresses as this will put unnecessary strain on them. Do not put heavy items, e.g. packed suitcases, on mattresses either. Avoid sitting on the edges of spring mattresses. - Each time you change the bedsheets, flip the mattress over and/or rotate it 180 degrees so that you sleep on all sides. This will help it retain its shape longer. - To stop mattresses from getting dirty or worn out, use a mattress protector or topper. Even slipping an old fitted sheet over the mattress before putting the outer sheet or duvet on will help. If you have a young child or pet that inadvertently wets the bed, cover the mattress with a rubber or plastic sheet, or with puppy housebreaking pads available from vets or pet stores. Clean up stains immediately with disinfectant and/or deodorisers (e.g. baking soda) and air the mattress out if possible. - To keep pillows clean, slip on an old pillowcase under the existing pillowcase. Try not to cry into pillows, but wash and dry them out if you do. Do not eat or exercise in bed, or use pillows and cushions for pillow fights. Get pillows and bolsters of the right size for your needs so you would not keep folding or bending them in two. Fluff them up and air them out to help them retain their shapes. Wash and dry your pillows as needed, if they are made of washable materials. Put your pillows, mattress and duvets under the sun to deodorise and air out. Restuff old pillows and cushions with cotton and other stuffing, and repair tears and rips with cloth before the stuffing falls out.